The American Masters art sale will take place during a special gala event on Friday, October 12 from 6:00 pm – 8:00 pm. Having purchased their historic brownstone building in 1917, the Salmagundi Club worked with Historic Preservation architect Lisa Easton of Easton Associates to completely redesign and renovate their Upper Gallery space with new walls, floors, climate control and state-of-the-art lighting to provide an exhibition space worthy of the compelling works that will be hung in the gallery. The versatile space even boasts a concert piano for special musical events. Sales from prior American Masters exhibitions initiated significant funding for the renovation project, along with major gifts from the Manton Foundation and a matching grant from the New York State Dormitory Authority. Club members have also made and continue to make generous contributions, along with non-member art enthusiasts. The Salmagundi Club began in 1871 as a sketch class in Johnathan Scott Hartley's studio. 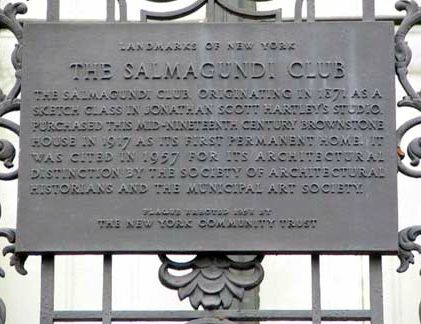 The Club’s name was inspired by Washington Irving’s "The Salmagundi Papers," a potpourri of wit and wisdom. In 1917 members purchased a gracious, mid-nineteenth century brownstone mansion as its second home. It was cited in 1957 for its architectural distinction by the Society of Architectural Historians and the Municipal Art Society. Following a tradition of 140 years, the Salmagundi Club continues to serve as a center for fine artists from New York and around the country by providing exhibitions of paintings, sculpture and photography, conducting art classes and painting demonstrations and art auctions throughout the year. Its membership includes not only artists, but patrons and lovers of the fine arts as well. All of its exhibitions and most of its events are open to the public. Over the years the Club has been the singular gathering place for such great artists as Thomas Moran, Childe Hassam, William Merritt Chase, Howard Pyle, N.C. Wyeth, Carl Rungius, Louis Comfort Tiffany, Ogden Pleisner, Ernest Blumenschein, Augustus Saint-Gaudens, Frank Tenney Johnson, Charles Dana Gibson, and many others. Honorary members have included such luminaries as Sir Winston Churchill, Buckminster Fuller, Paul Cadmus, Al Hirschfeld, Thomas Hoving. With today’s renewed appreciation for high quality representational art, the Salmagundi Club continues to burnish its reputation as a premier organization for contemporary fine artists. Using your ballots. If you will be attending the Event, you will receive a “ballot” book consisting of slips of paper with your buyer number printed on them. During the Reception, place the appropriate ballot(s) into the corresponding ballot boxes for the artwork(s) you would like to purchase. Each collector may place their ballots in the boxes for as many different artworks as he or she chooses. However, buyers may use ONLY ONE ballot for each artwork. Each ballot used is an “intent to purchase.” Use the ballots only for artwork you want to purchase in the event your name is drawn. Drawing of ballots. Two names will be drawn and posted for each work of art. The first person whose name is drawn will have 10 minutes to accept or decline the artwork. If declined, the option to purchase will pass to the next name drawn. This process will repeat if necessary. If you are present at the drawing and your name is drawn for multiple artworks, you are not obligated to purchase more than one. Please let the Salmagundi volunteer know if you will not be taking the piece so that the next person drawn may complete the sale. Before the conclusion of the Gala, payment arrangements will need to be made for each artwork purchased. If you will not be present, you will need to contact a representative of the Salmagundi Club to make payment arrangements prior to the drawing in the event your name is drawn. Remaining artwork. After the “drawing” concludes, any remaining artwork is available for purchase by the general public. All artwork will remain on display in the Salmagundi gallery.